EXACT Function in Excel (Formula, Examples) | How to use EXACT? How to Use EXACT Function in Excel? 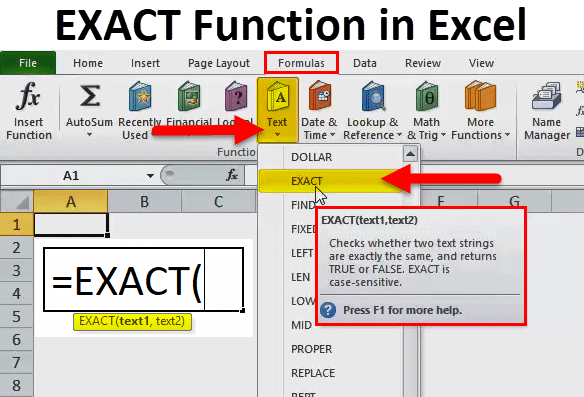 EXACT function is an inbuilt function in excel that is categorized under TEXT function. It is used as worksheet & VBA function in excel. EXACT function in Excel is used as a part of a formula in a cell of a worksheet & also integrated with other excel functions (IF, SUMPRODUCT & various other formulas of excel). It is most commonly used to perform a case-sensitive lookup between two strings. Excel is very easy to use and simple function with two arguments. Checks whether two strings are exactly the same, and returns TRUE or FALSE. It means EXACT function in Excel compares two strings between two cells and returns TRUE if both values are same & similar. Otherwise, it will return FALSE, if both the strings do not match. 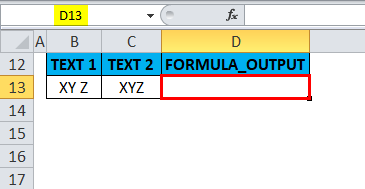 The EXACT formula in excel has two parameters i.e. text1, text2. Text1: It is the first text string that we want to compare. Text2: It is the second string that we want to compare. The arguments can be entered manually or cell reference can be given. Exact function is case-sensitive. i.e. Capital letters are not equal to small letters. It will return a FALSE value if there is a Leading or trailing space in any text strings, small or capital letters in a text string, Extra space between alphabets in a text, or uppercase or lower-case text between two strings or text. Equal sign in a formula of exact function can also be used i.e. (text1=text2) to compare text strings. Instead of the EXACT function, double equals (==) comparison operator is also used to Compare between two strings. For example, =X1==Y1 returns the same value as =EXACT(X1,Y1). EXACT function in Excel is very simple and easy to use. Let understand the working of EXACT function in Excel by some EXACT Formula example. Here in the below-mentioned example. Cell B9 & C9 contains text strings, With the help of EXACT function, I need to check whether the two cells have the same data or not. Let’s apply exact function in cell “D9”. Select the cell “D9” where an EXACT function needs to be applied. Click the insert function button (fx) under formula toolbar, a dialog box will appear, Type the keyword “EXACT” in the search for a function box, an EXACT function will appear in select a function box. Double click on an EXACT function. 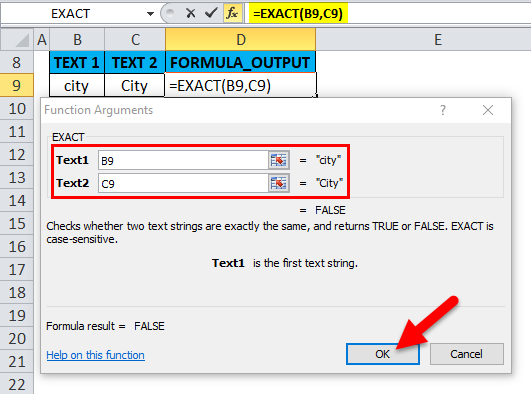 A dialog box appears where arguments for EXACT function needs to be filled or entered i.e. =EXACT(B9,C9) Here, I need to compare between B9 & C9 cell, hence it is entered in the function arguments of an exact function. Click ok once it is entered. In the below-mentioned example, the EXACT function returns a TRUE value, Because both values in the cell B10 & C10 are same & similar. i.e. Both the cells contain a proper case text string. Here in the below-mentioned example. Cell B13 & C13 contains the text strings, With the help of EXACT function, I need to check whether the two cells have the same data or not. Let’s apply exact function in cell “D13”. Select the cell “D13” where an EXACT function needs to be applied. A dialog box appears where arguments for EXACT function needs to be filled or entered i.e. =EXACT(B13,C13) Here, I need to compare between B13 & C13 cell, hence it is entered in the function arguments of an exact function. Click ok once it is entered. An EXACT function returns FALSE value because both the strings do not match with each other. ‘XY Z’ and‘XYZ’ are different, i.e. ‘XY Z’ contains space between letter Y & Z in text1, whereas ‘XYZ’ does not contain any extra space between letters in text2 column. An EXACT function returns a FALSE value if any extra space between alphabets in text or even if there is a Leading or trailing space in any text strings. In the below-mentioned example, the EXACT function returns FALSE value because there is a leading space in the cell “B14”, before the word XYZ, you can observe two extra space. In the below-mentioned example, Cell B18 contains $99, where it is in a dollar value as currency format & C18 contains the 99, in number or general format. With the help of EXACT function, I need to check whether the two cells have the same data or not. Let’s apply exact function in cell “D18”. Select the cell “D18” where an EXACT function needs to be applied. 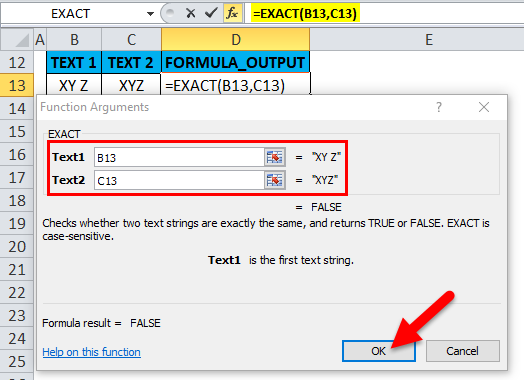 A dialog box appears where arguments for EXACT function needs to be filled or entered i.e. =EXACT(B18,C18) Here, I need to compare between B18 & C18 cell, hence it is entered in the function arguments of an exact function. Click ok once it is entered. An EXACT function returns TRUE value because both the cell contains the same value i.e. 99. Here Exact function ignores format pattern of cells. In the below-mentioned example, the EXACT function returns TRUE value because both the cell contains same date value i.e. Cell “B19” contains the date value (5/16/18) in number or general format whereas in cell “C19” date value is present in date format. Here Exact function ignores format pattern of cells. EXACT function is case-sensitive. i.e. Capital letters are not equal to small letters. 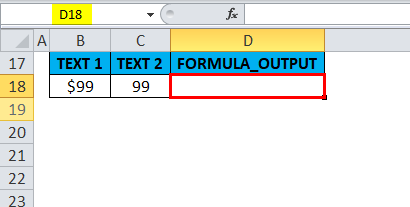 Exact function in Excel returns the false value if there is a difference in case pattern between text string i.e. sentence case, lowercase, uppercase, proper case & toggle case. 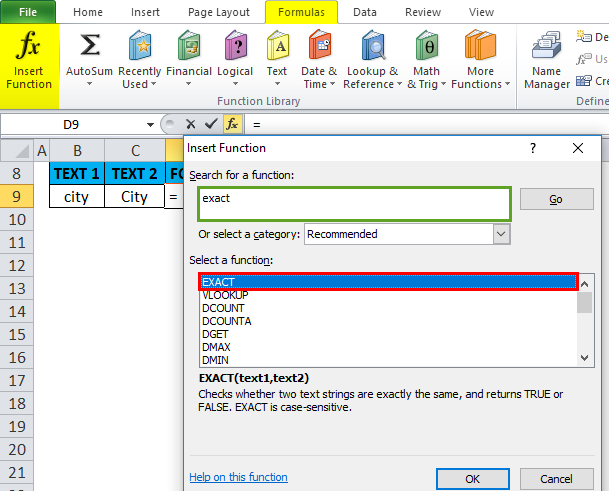 Exact function in Excel returns the false value if there is Leading or trailing space & Extra space between alphabets in the text between two text strings. EXACT Function in Excel ignores formatting difference between the two cells. How to use the PMT Function in Excel?